ICD was established in 1917 with the mission of helping wounded veterans of World War I improve their quality of life through vocational rehabilitation. We’ve been transforming the lives of New Yorkers ever since. President Herbert Hoover meets an ICD client, flanked by Margaret Milbank Bogert, daughter of the founder, in 1949. 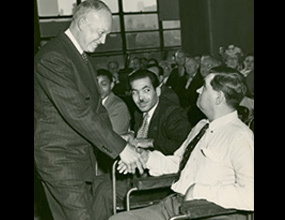 President Truman awards George E. Barr the 1951 President’s Award for his contribution to employment of people with disabilities. Dave Garroway of The Today Show serves Thanksgiving dinner to ICD clients in 1956. Founder Jeremiah Milbank Sr. looks at new building plans with pediatric patients in 1962. Jeremiah Milbank, Jr. and Margaret Milbank Bogert, son and daughter of the founder, meet with President Nixon in the Oval Office in 1970. Danny Kaye, Laurance S. Rockefeller, and Margaret Milbank Bogert at the 1982 ICD awards dinner. Jeremiah Milbank, Jr., George Bush, Sr. and Jeremiah Bogert (grandson of the founder) at an ICD event in 1983. Nancy Reagan and Jeremiah Milbank, Jr. at the 1984 ICD Awards Dinner. 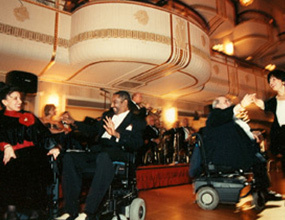 The ICD Freedom of the Human Spirit Awards Dinner at the Waldorf Astoria in 1996. Every year our graduates build upon our legacy of success. We were pioneers in the field of rehabilitation, and over our nearly 100 year history, we expanded our scope of service to include a range of health and therapeutic services for people with disabilities. Throughout all this, workforce development has always remained central to our mission. Beginning in 2013, we have returned to our original and core mission of guiding people with barriers to employment to gain skills, enter the workforce and live happy, productive lives. We look forward to another 100 years of service to New York. Scroll through our history with us to learn how we are building upon our history to pave our future.